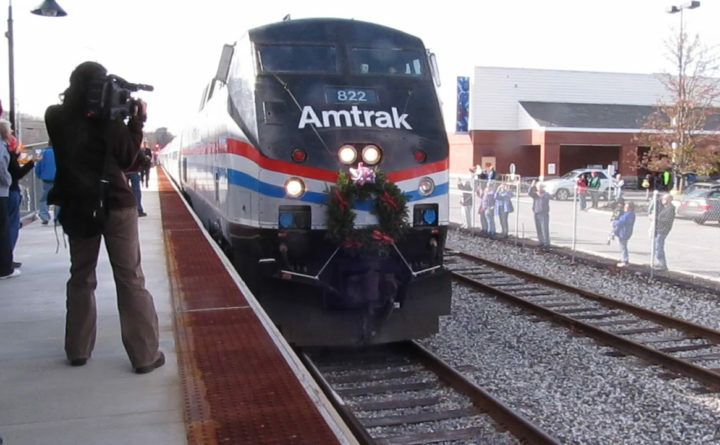 The first trip of the Amtrak Downeaster's new passenger train service from Boston to Freeport and Brunswick arrives at Brunswick's Maine Street Station on Thursday, November 1, 2012. A pilot program that would bring seasonal passenger rail service as far north as Rockland is being explored by the transportation authority tasked with handling the state’s contract with Amtrak’s Downeaster service. The pilot program would extend the Downeaster’s rail service ― which begins in Boston ― up the coast from its current northern point of Brunswick, adding new stops in Bath, Wiscasset, Newcastle and Rockland. The program was announced Monday night at the annual board meeting of the Northern New England Passenger Rail Authority (NNEPRA) as one of its goals for 2018. A public transportation authority, NNEPRA was created by the Maine Legislature in 1995 and tasked with developing passenger rail service between Boston and Maine. NNEPRA holds an agreement with Amtrak to operate the Downeaster rail service. Its most recent expansion occurred in 2012, when Downeaster service was extended from Portland to Brunswick. While the project is still in the early stages of planning, Bogart said NNEPRA feels seasonal extension of passenger rail service to these coastal communities “could be turned around very quickly,” perhaps as soon as summer 2018. A planning schedule for development of the program will be mapped out in the coming weeks, Bogart said. That process would include a series of public meetings. NNEPRA is viewing the feasibility of bringing seasonal rail service north of Brunswick as simply an extension of its existing passenger rail service schedule and equipment. Bogart said the rail line that extends from Brunswick to Rockland has been upgraded to passenger standards, though a more intense feasibility review will be a part of the planning process. Among the details that need further consideration as part of the expansion would be if upgrades are necessary at some stations, Bogart said. The pilot program would likely run from Memorial Day to Labor Day on weekends only, providing one daily round trip from Boston, Bogart said. Maine Eastern Railroad previously ran excursion trains between Brunswick and Rockland, but those trains stopped in 2015. Correction: A previous version of this story said that investments would need to be made at some of the stations. However, Bogart intended to say that the state of the stations would need to be looked into.